Walterstown by 3-6 to 2-3. Then they suffered a narrow 1-6 to 1-5 loss to Kerry Champions Southern Gaels before drawing with their hosts which was enough to qualify for the Cup quarter final. Here they came up against the Cork Champions Éire Óg and after a great effort lost out to the eventual winners. Thanks to all the Management, players, sponsors and supporters who travelled to support the team and all who came out to welcome them back on Sunday evening. Well done to Andrea Trill, Katlyn Kearney, Shauna Flaherty and the Galway Minor ladies who defeated Cavan after ET on Saturday and go on to play Cork in the All-Ireland Final in two weeks’ time. Good luck to Selector Eugene Kearney and players Ava Murry, Kiera Kearney Chaleene Trill, Laura Flynn Kate Slevin Shauna Brennan, Hannah Walsh and the Galway u16 who play Donegal in the All-Ireland Semi on Wednesday evening on Sligo. 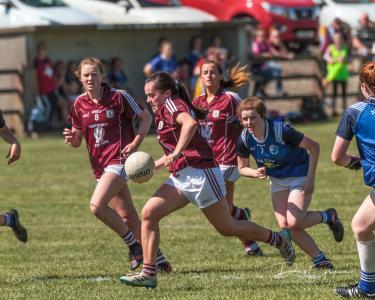 The Claregalway Senior ladies play Dunmore in Knockdoemor Park on Friday in round 1 of the Championship while the Junior are away to St Marys on Saturdays evening in Barnaderg at 7pm. Well done to our green U12 team who played their league final in glorious sunshine on Friday evening in Caltra. Unlucky to lose narrowly to Loughrea. A wonderful display of Team work and skill from these fantastic Girls. Thanks to ray Quinn J Meehan and Breda Lynch.